In 2015 the number of tourists to Japan was just under 20 million. However, 2016 saw a rise up to 24 million tourists (Japan Today). JT also reports that most visitors came from South Korea and China. Most travellers stuck to the so called “golden route”, and not visit the lesser known destinations in Japan. Japan Today did not define it, but it can only be supposed that the “golden route” must be the main guidebook attractions in Tokyo, Kyoto, Osaka, and Kobe. 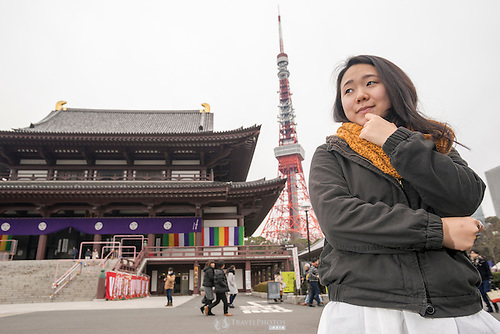 A young Japanese lady standing in front of Zojo-ji Temple, which Tokyo Tower in the background. 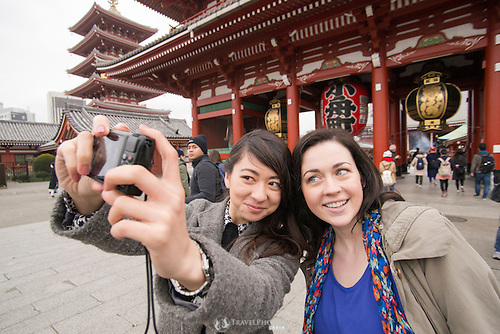 This Photo of the Week (POTW) is of Ana and Joanie at Sensoji Temple, a premier tourist attraction in Tokyo. It was great to work with Ana again, and to work with Joanie for the first time. They were great to work with and helped to make a great collection of images like this selfie. For more images like this, see the Ana, Joanie, Tokyo, and Alamy galleries. Sensoji Girl Update to the JapanesePhotos Instagram at: http://bit.ly/1pLob6u. This photo also received “Popular” scored 91.6/100 on 500px (here). This Photo of the Week (POTW) is of Miyu at Sensoji Temple in Asakusa, Tokyo (Wikipedia). This photo was taken on my first day ever in Tokyo. Yes, I have been in Japan for many years, and have never taken a trip to Tokyo ever before. I had just dropped my bag off at the hotel, not being able to check in until 3pm. I met up with my model and we made our way to Sensoji Temple and created a great set of photos. Miyu at Sensoji Temple, with Tokyo Skytree Tower in the background. Sensoji Temple is probably the first religious site in the area that later became a town, city, and then “Tokyo”. It is said that in 628AD two fisherman came across a small gold statue of Buddha in the near by river, which also marked the approximate location that the temple should be. The statue is so sacred that it has long been hidden away from public view (if it still or ever has existed). 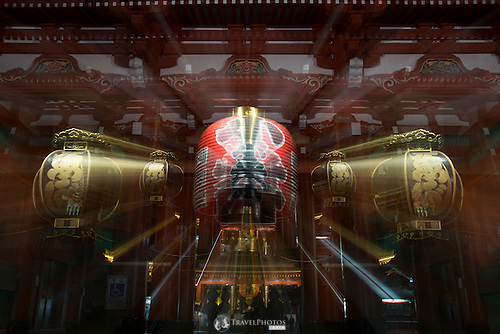 Consequently, this temple was probably the first and oldest tourist attraction in Tokyo. The site was bombed in World War II, and has been rebuilt partly as a symbol of resurrection of the city. Today, it is the most visited ‘tourist site’ in Tokyo and possibly Japan for overseas tourists. I heard people speaking English, Spanish, Russian, Chinese, Korean, (probably) Thai and Vietnamese, and of course Japanese. Photo galleries: Alamy, Ana, Joanie, Miyu, Tokyo. Where: Closest subway station is Asakusa Station on the Ginza Line of the Tokyo Metro. When: Any time of year. Best is obviously when the cherry blossoms (sakura) are in bloom, early summer, and Autumn with the changing colour of the leaves. Best to go early in the morning before 10am before the crowds get to thick, and in the evening when it’s beautifully lit. 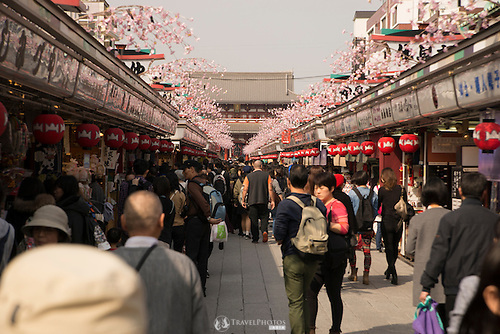 What to see: Kaminarimon Gate, Sensoji Temple, Nakamise Street (shopping & souvenirs), Tokyo Skytree Tower (a 17min walk away), the kabuki and geisha districts. A view of Nakamise Street filled with stalls selling souvenirs for tourists, and at the end if Sensoji Temple. What to do: Enjoy the sights. Take a rickshaw ride and tour of the area. Enjoy a kabuki performance in the area. What to eat: Surprisingly, there are a lot of restaurants that say they have English and Chinese menus. A lot of restaurants have pictures or wax samples of their food on display out the front. 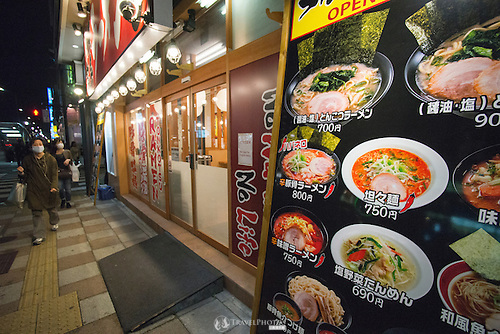 It is possible to find a good hearty meal for under ¥500 (USD$5), but more usually about or under ¥1,000 (USD$10). Also see food. A ramen restaurant in Asakusa. Where to stay: There are many hotels in the area, which are reasonably priced. This area is on one of the main subway lines, which gives good access to much of the other interesting places in Tokyo. The Ginza Line of Tokyo Metro gives you straight line access to the famous Ginza district, and Shibuya. 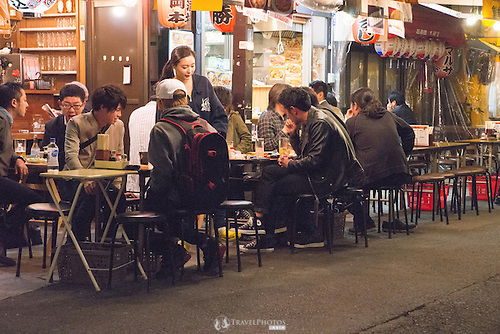 Friends enjoying dining out at street eateries. As mentioned in the the previous post, it’s Cherry blossom season. Cherry blossoms are known as ‘sakura’ in Japanese, and ‘hanami’ is to do ‘Cherry blossom viewing’. What I’ve been wanting to do for a long time was to visit a very historical temple and do my own hanami, there. Temples and shrines in Japan typically have lots of cherry blossom trees, which make some of them a tourist-magnet in cherry blossom viewing season. Cherry blossoms blooming at Hase temple. I organised a friend (Paul), a car (Porte), and a sunny day (Tuesday). Unfortunately it took an hour longer to get to Hase town from my place, and so we missed the best of the early morning light. They say, “only mad dogs and Englishmen go out into the midday sun”, which is good because I’m an Englishmen, so I have licence. What remains in the photo collection at Asia Photo Connection are the pick of photos that can work with the midday sun.